The EBF supports the development of effective ways to deal with financial failure of banks to avoid any spill over to other financial institutions and the wider economy. Special resolution regimes and deposit insurance schemes for banks in the EU provide continuity of access to deposits and payments for banks’ customers which is a crucial component of the financial safety. But banks in the first place need to plan ahead for a crisis to consider recovery options and authorities needs contemplate escalating supervision early warning indicators and the in the worst case plan for an orderly wind down of a failing bank process. The 2008 financial crisis has demonstrated in particular the need for policy measures to address systemically important financial institutions to address the problem of firms that are “too big to fail”. The aim is to make it possible to resolve any financial institution in an orderly manner without severe systemic disruption or exposing taxpayers to the risk of loss, by protecting banks’ functions that are critical to the financial market or the real economy. Resolution funds funded by banks and the bail-in tool, which imposes losses on shareholders and creditors of a failing bank, support the resolution processs minimising the need for public financial support. In the EU the Bank Recovery and Resolution Directive sets out the powers and tools that national resolution authorities should have at their disposal for firms in all financial sectors that could have a systemic impact if they fail. 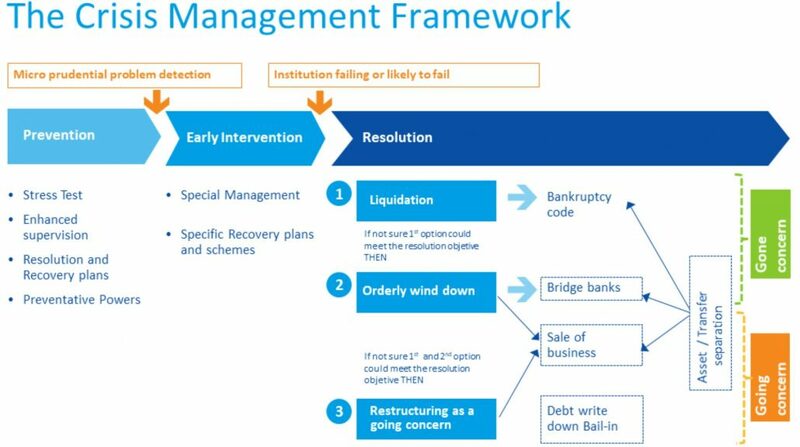 They also set out recovery and resolution planning requirements for all banks and, in addition, require that resolution colleges of home and key host authorities are set up to coordinate group-wide resolution strategies and plans for systemic banks. Deposit guarantee schemes (DGS) reimburse a limited amount to compensate depositors whose bank has failed. A fundamental principle underlying DGS is that they are funded entirely by banks, and that no taxpayer funds are used. 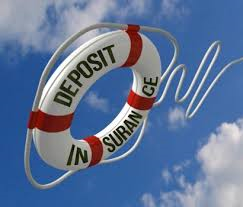 Under the EU Deposit guarantee schemes Directive, deposit guarantee schemes protect depositors’ savings by guaranteeing deposits of up to €100,000. This help prevents runs on deposits in the case of bank failure which is key feature of the European financial safety net. The directive includes a gradual reduction of the repayment times of deposit guarantees to 7 days by 2024. EU countries are obligated to introduce laws setting up at least one DGS that all banks must join. EU countries must ensure a harmonised level of protection for depositors and produce lists of the types of deposits that are protected. DGSs set up and officially recognised in 1 EU country must cover the depositors at branches of their members in other EU countries. It also restates the principle of resolving bank failures with the use of funds provided by financial institutions, and not by taxpayers.